This article originally appeared online on TeleSUR English. 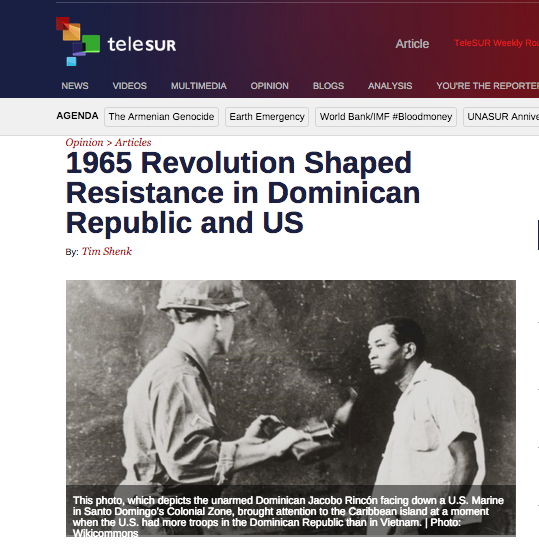 April 24, 2015 marks the 50th anniversary of the 1965 revolution in the Dominican Republic, a landmark not only for the people of that Caribbean nation but a turning point for many in the United States in considering their government’s role in Latin America. On April 24, 1965, Dominicans poured into the streets of Santo Domingo to overthrow the military triumvirate that had ousted the democratic administration of Juan Bosch 19 months before. Fighting ensued that brought to light schisms among the country’s institutions and armed forces. Generals still loyal to the Rafael Trujillo dictatorship of 1930-61 fought the popular Constitutionalist rebellion, led by Bosch’s Partido Revolucionario Dominicano (PRD), the Maoist Movimiento Popular Dominicano (MPD), the urban poor and the lower ranks of the military, led by colonel-turned-revolutionary Francisco Caamaño. There may be no more fitting image of the spirit of Dominican struggle than Juan Perez Terrero’s photographs, taken in 1965 during the U.S. military intervention in the Dominican Republic. 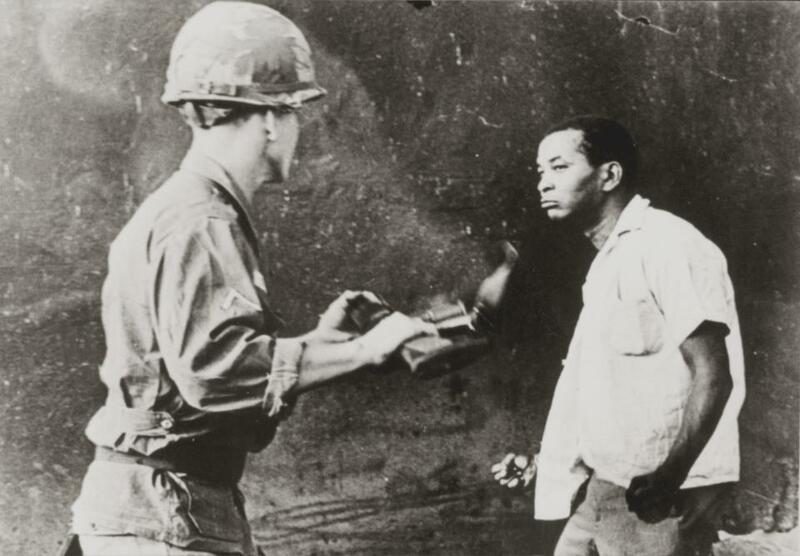 This photo, which depicts the unarmed Dominican Jacobo Rincón facing down a U.S. Marine in Santo Domingo’s Colonial Zone, brought attention to the Caribbean island at a moment when the U.S. had more troops in the Dominican Republic than in Vietnam. Half a century later, Rincón’s intensity still represents popular resistance and human dignity in the face of a violent power. The Constitutionalists, so named because of their aim to reinstate Bosch and the populist 1963 constitution, took over the National Palace and Armory and dug in against the tank and aerial barrage of the conservative wing of the Dominican Armed Forces. After four days, U.S. President Lyndon Johnson chose to intervene. On April 28, the first of 42,000 U.S. soldiers came ashore in the Dominican Republic under the pretext of saving lives and protecting U.S. interests, but with a covert motive of “preventing the emergence of a second Cuba in Latin America.” Though hardly unprecedented in U.S. foreign policy, this massive military presence on the agrarian Caribbean island dwarfed the U.S. force in Vietnam at the time. U.S. Marines joined the Trujilloist forces, slowing Constitutionalist momentum and forcing negotiations that would lead to the bloodstained election of Joaquin Balaguer in June 1966. In the first half of that year, Balaguer’s Partido Reformista and Trujilloist army officers had led a terror campaign that assassinated over 350 leaders from the PRD, MPD and other left parties in order to secure victory. Bosch himself could not even leave his house to campaign, for fear of being killed by a military patrol. Dominicans protest the Supreme Court’s decision not to investigate the allegations of fraud and illicit accumulation of wealth against Dominican senator Félix Bautista, April 2015.